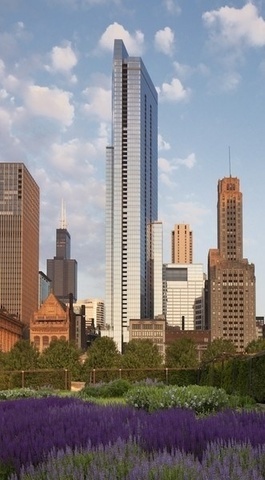 Spectacular South East facing 2 bed, 2 bath unit at the award-winning Legacy at Millennium Park. This ~1,500 square foot unit has forever views of Lake Michigan, Buckingham Fountain and Millennium Park. Unit features extra high ceilings, floor-to-ceiling windows with electronic shades throughout with blackout shades in the Master bedroom, in unit Bosch washer/dryer and large SE facing balcony. Chef's kitchen with granite countertops and stainless-steel appliances. Natural stone baths including a master spa bath with separate shower, soaking tub and double bowl vanity. The only floorplan with an 8x5 in-unit storage closet. A+ building amenities include a 24hr door person, indoor heated lap pool, whirlpool spa, steam rooms, fitness center, sun deck and 2 sky decks with resident lounges. Steps to Michigan Ave, transportation, Millennium Park, Art institute, theater district and much more. Prime parking spot available for $50k. Space is isolated with no cars on either side of it. Directions Wabash to Monroe. East to 60 Monroe, just before University Club. Property information last modified by seller on Monday, December 17, 2018, 12:04 PM CST. Information Deemed Reliable But Not Guaranteed. Unauthorized duplication, use, or linkage is prohibited. The information on this web site is for personal, non-commercial use and may not be used for any purpose other than to identify prospective properties consumers may be interested in purchasing. Monthly Payment Calculator results are for illustrative purposes only, not a financing opportunity; calculations assume a 30-year fixed-rate mortgage and do not include closing and other costs. Property Tax on NEW properties is estimated at 1.5% of Listing Price for payment calculation purposes; actual value may be higher or lower.